Namine asked for one thing in particular: her very own kitchen. When it comes to presents, Namine has never been discontent with what she already has. She might see a toy that she wants in a commercial or while we’re at the store, but she’s never had a long wish list when we’d ask what she wanted for her birthday or Christmas. Her requests are never far from what she already loves — dinosaurs, My Little Pony, that sort of thing. This Christmas season, Namine had her heart set on one thing: having her own kitchen. 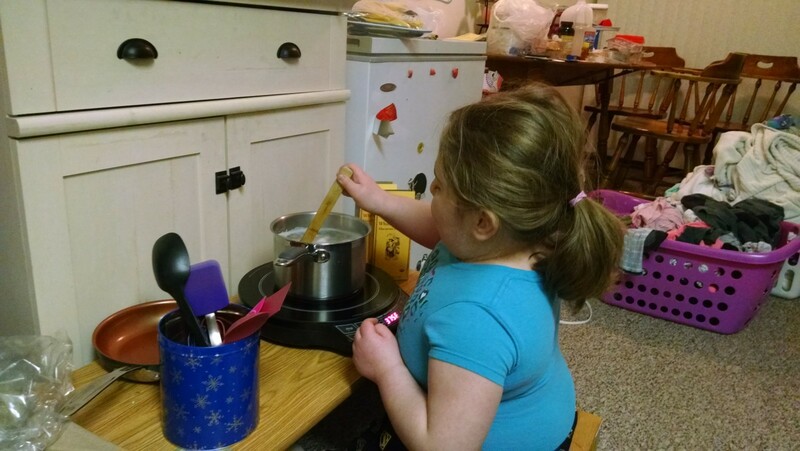 She didn’t want a toy kitchen, — she already has plenty of play food stuff, including the toy oven, sink, and stove — no, she wanted the real deal, but sized right for her. Namine has asked us plenty of times, enough so that we’ve lost count, by now, if she could help us out in the kitchen. And we do what we can to include her, so when we bake, we do our mixing on the floor, so she can help — but it’s obviously not enough. 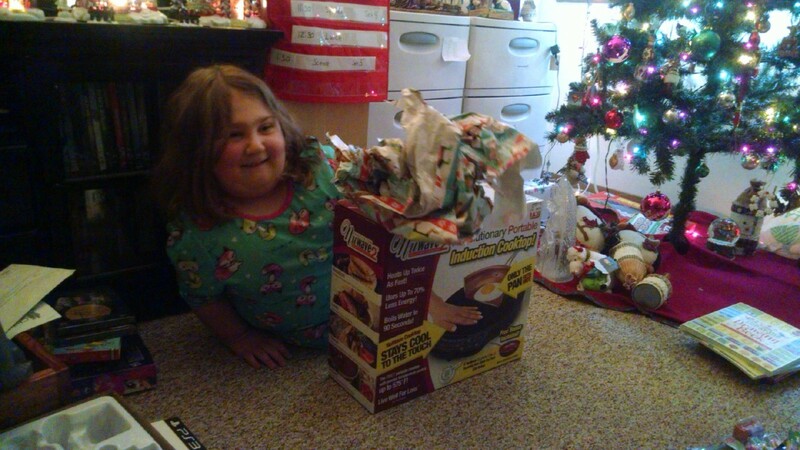 She wants more, so we bought an induction stove for her. When Namine opened up this present, which we had saved for last on Christmas Day, she exclaimed, “This was my wish!” She was so happy. It’s not a whole kitchen, but it’s a good start. So last night, we decided to have macaroni and cheese and li’l weenies for dinner. With my help, Namine made the macaroni. Since there’s only one “burner” on her induction stove, I boiled the weenies myself. After explaining the basics of the stove and having a talk on safety (the induction stove surface may not get hot, but anything on it does), I filled a pan with water and set it on Namine’s stove. 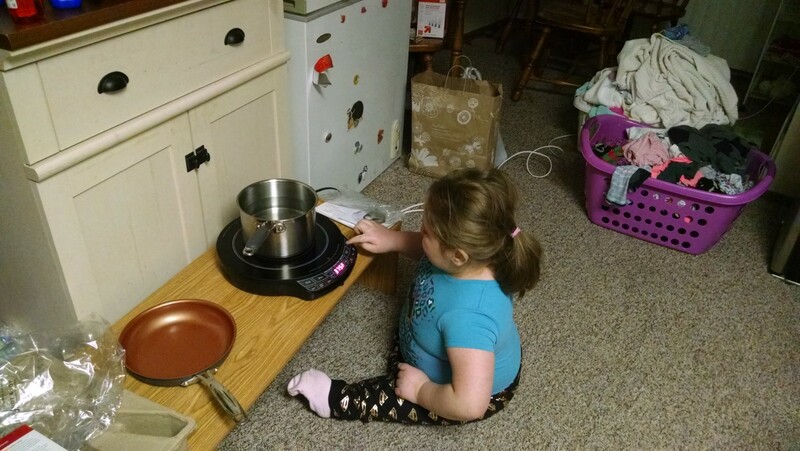 She turned it on (it’s nice that the controls are all in the front of the burner, instead of having to reach over the pan like on ours). While she waited for the water to come to a boil, Namine flipped through the manual. In addition to directions for using the stove, it also came with several recipes, including meals, desserts, and snacks. It looks like the perfect thing to start Namine out on how to follow recipes. 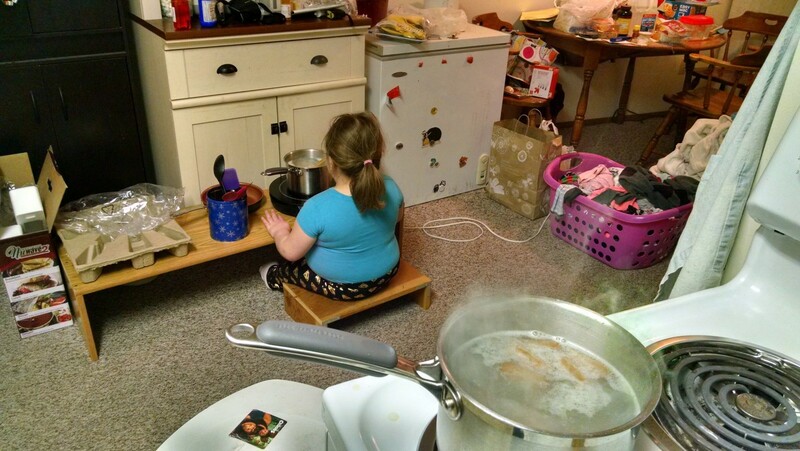 When the water came to a rolling boil, Namine dumped the noodles in. As the noodles cooked, I showed her how to spoon a couple out to see if they’re done. She blew on them, offering one to me and trying the other herself. She prefers her pasta al dente, much like Jessica and myself, and she let me know when she thought the pasta was done. I agreed. Since there was no way for Namine to drain the noodles, I took care of that. Putting the pan back on Namine’s stove, I asked her to turn down the heat. She did so. 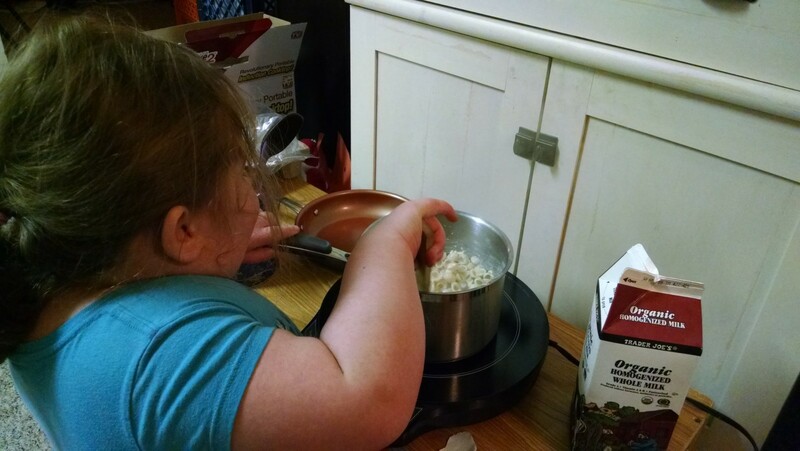 She then opened up the cheese packets, dumping them in, and then we measured out the milk together. (Namine held the measuring spoon and I poured.) Namine stirred it all together (I helped make sure all the cheese powder clumps were gone), and voila! Mac and Cheese A La Namine was complete. I dished it out along with the li’l weenies, and it was delicious. Super good Christmas idea! My toddler told me he wanted cake for Christmas because he had some toys already. I think our kids have the right idea. 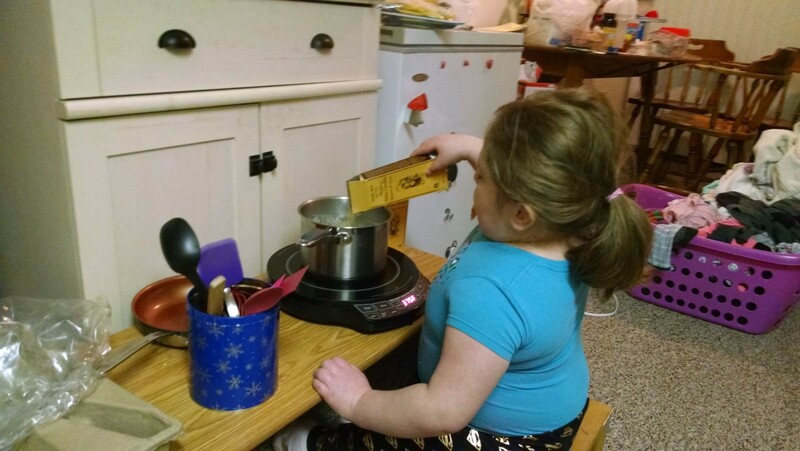 Not only did you grant Namine’s dearest Christmas wish, she’s beginning to learn the important life skill of cooking. Thanks for adding it to DifferentDream.com’s Tuesday special needs link up.